Being more of a tropical person, I’m not the sort you would catch exploring the Arctic wilds. However, there are a number of researchers out there that do spend time doing sciencey stuff in the Arctic. Last summer a group of researchers exploring Canada’s Ward Hunt Island made a very cool discovery. The scientists happened on a manmade rock cairn and inside the rocks was a bottle with a letter in it. When they pulled the letter out of the bottle, they realized it was from an American geologist named Paul T. Walker and he had left the letter behind in 1959. The letter was no cry for help, rather it was a request for anyone who came upon the letter to take a scientific measurement and forward it to Walker and a colleague for their records. The request was to measure the distance of a rock formation from the face of the glacier nearby. When the letter was placed in the rocks, it was 168 feet from the glacier face. 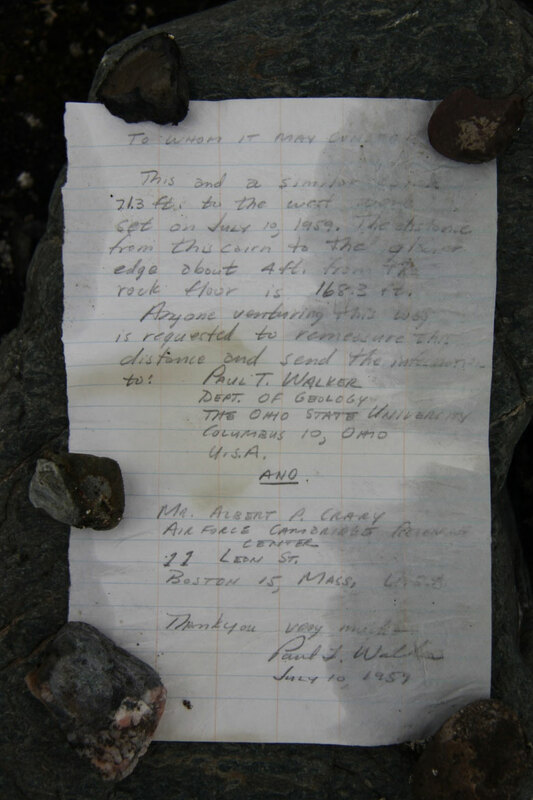 When the letter was found this summer, the rock was about 333 feet from the glacier face. Sadly, Walker never received the information he requested. Shortly after he placed the letter in the rock formation he suffered a seizure and was flown out of the Arctic and died in a hospital a few months later. Interestingly enough, after discovering the note, the explorers returned the message to its bottle – adding their own note they hope may someday be found in the future.